Take drinks to go without relying on plastics. 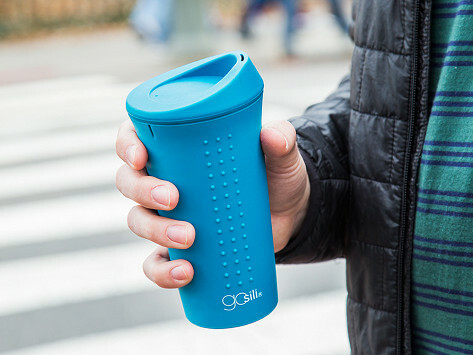 This sturdy travel mug is made entirely from non-toxic silicone that holds its shape thanks to an embedded (and microwave-friendly) stainless-steel ring that gives it structure. Dimensions: 3.5" diameter x 7"
Exceptional product, worth every penny! Right size for car, morning lemon water, dishwasher and bedside. Like screw on top too. Well done. I love these so much I have bought three of them. The most important thing I love about them is that they are dishwashable.